Hello Everyone and welcome to my blog today! 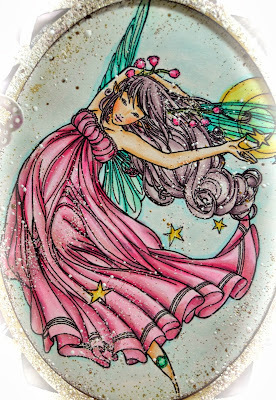 May is a digi stamp colored in Copics on Neenah Paper available at 7 Kids College Fund Store. I used Shabby White Embossing powder from Stampendous around and on the image like fairy dust. I have a few Magnolia Doohickeys in the corner like So Wrapped Lovely and Dragonfly. 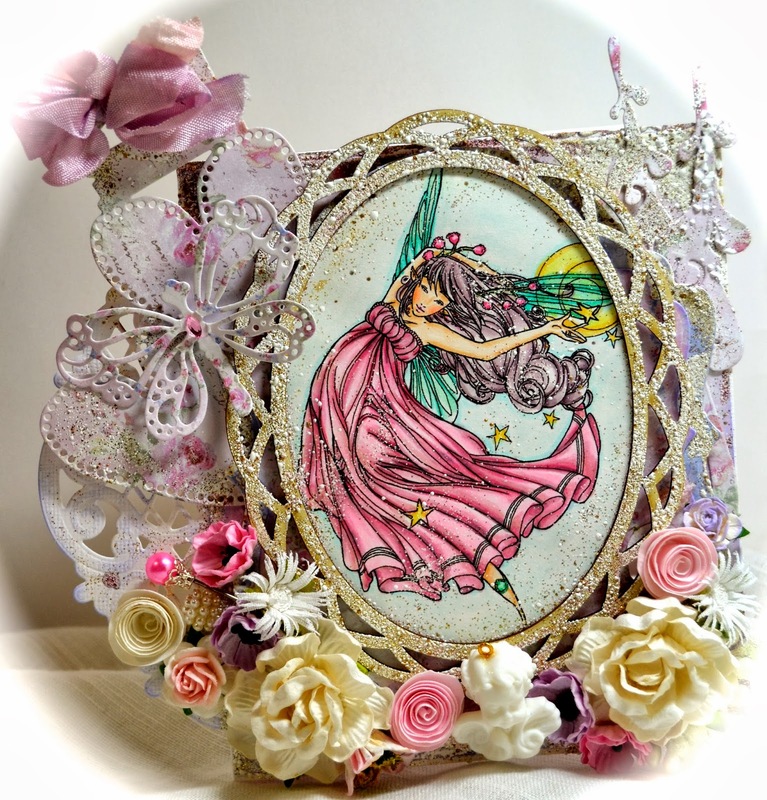 The frame I used to frame May is from La La Land Crafts. I love flowers so I made another flower garden on this card. I wanted to show you this adorable Cherub that was part of a candy that I won from Eulanda Silvey. He fits perfectly in the flower garden. Thank you for stopping by and leaving me very sweet comments, I love them. My family is still here and leaves me with little time to myself so be patient with me as I get around to your blogs every week. Is this card on it's way to your friend Marilyn? Hope so because it is gorgeous! I love the 'old world' vintage look this has with all the Frantage and flowers. Sure is pretty and I know I'm gonna love it! This is stunning Kelly. 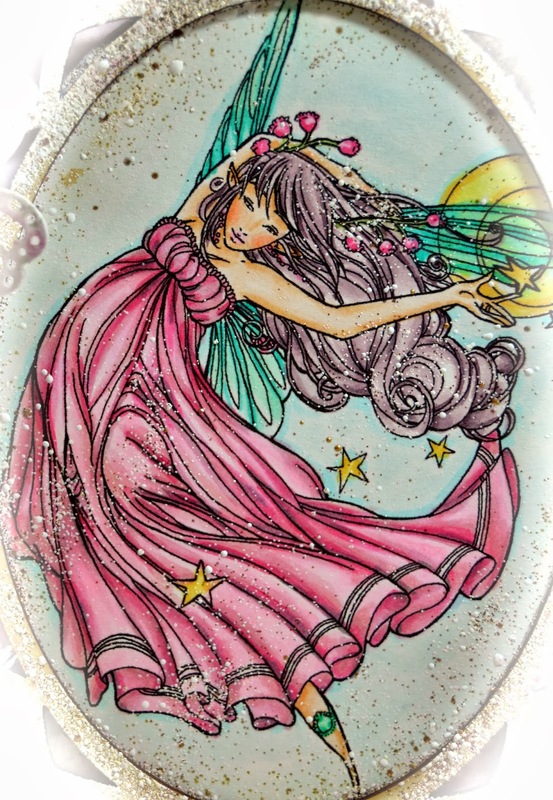 The fairy is adorable any your embellishments and design are gorgeous. Love the tag with the bow. Oh, WOW!!!! So fantastic! 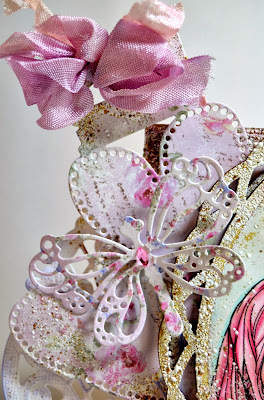 Lovely frame and such yummy details! I saw this work of art on FB and I'm absolutely swooning!!!! Love the image and your coloring is beyond gorgeous.....phenomenal!!!! Beautiful shading, gorgeous details and the frantage adds so much glamor to this stunning creation. Love the frame....stunning, Kelly! OH! Kelly... quite an adventure in coloring this image is! and you did very very well. such intricate details, and yes ... shading is not so easy. All your embellishments are beautiful, and so nicely put together. outstanding work friend! Hugs. The card is beautiful with the flowers, butterfly, your die cut and that bow you have at the top! Wonderful coloring! The cherub is so sweet. Oooooooo I'm with you on coloring those images - a bit complicated for me but you did a good job with it!! I see you added a bit of your mixed media into it, which is really pretty and I LOVE YOUR BOUQUET!! WOW!! Thanks for letting me know. The cherubs are a little tough to use so I was just curious to see someone else use it. Perfect!! Hugs! Fantastic, this card is magical, wow ! Oh so beautiful Kelly! What a luscious creation with so many yummy details to admire. Great coloring and love the flowers. Darling cherub surrounded by beauty! Wonderful textures too. What a delightful card for your friend! This is really pretty Kelly - one of your best makes I do believe. Your coloring is wonderful. Do you have your cell phone back yet. I was told that it was going to be gone for several days!!! !